I really enjoy salads as a starter – and also a really good opportunity to get creative. To date, I have cobbled together: A Watercress and Pomegranate Salad; Smoked Mackerel, Blueberry, and Fennel Salad; Flambéed Pear, Blue Camembert and Walnut Salad; and finally my version of the classic Salade Niçoise . I have made many salads since, but nothing more effort thank throwing some raw ingredients together and whipping up a simple vinaigrette. They taste great- don’t get me wrong, but I was really looking out for another opportunity to create something which would be good enough to serve guests as a starter – something different, a little unexpected, and ‘designed’ – the idea that each ingredient has a distinct purpose, and each adds a little extra boost of flavour or texture. This got me thinking… how about a starter with cheese as the primary ingredient? The first time I tried Halloumi – (the semi-hard, unripened brined cheese made traditionally from a mixture of goat’s and sheep’s milk) was when studying at Cardiff University. A good few years ago. A Cypriot friend I made there gave me a block of Halloumi cheese as a gift, and rather naively I ate it like a normal cheese and thought it was a tad chewy, salty and not exactly for me. I was, foolishly, underwhelmed. 8 years later, I happened to go to Cyprus and stayed a week in Nicosia with Petros who was my classmate during my MA degree. I was introduced once again to Halloumi, and this time – it was a revelation – it arrived grilled and warm and served very simply with some salad leaves and lemon wedges. It was simple, yet delicious. Since then, I will gladly pick up a block whenever I see it in the cheese aisle. And, I have not repeated my original mistake. I do enjoy strong flavour contrasts. In a similar way that the saltiness of Parma ham goes so well with melon, or even gammon with pineapple, I wanted to find a sweet counterpart that would really complement grilled Halloumi cheese. After some rummaging in the bottom of my fridge, I found a ripe mango and decided to get a little creative. This recipe is very quick and simple to put together, and one I will return to whenever the opportunity arises. My Grilled Halloumi, Chicory and Mango salad also contains rocket, spinach, lightly toasted pine nuts, red onion, lime, and, optionally, a little Parma ham. I am sure it is possible to ‘go large’ and have it as a main dish instead. 1 x red chilli, deseeded and sliced. Preheat grill to a medium-high setting. Unwrap the Halloumi cheese and carefully slice into 12 slices. Place on a baking tray lined with thick kitchen foil. Grill for about 3-4 minutes, until the top of Halloumi turns a golden brown, then turn over using a pair of tongs and repeat. Remove, and wrap in a clean sheet of foil to keep warm. Next, time to assemble the salad itself. On a medium-sized plate, layer a small handful of spinach leaves followed by rocket leaves. Next, add the red onion wedges, sprinkle with pine nuts, and scatter the small mango cubes. Then, scatter the chicory batons on top. Delicately place the Parma ham swirls (if using) on top. 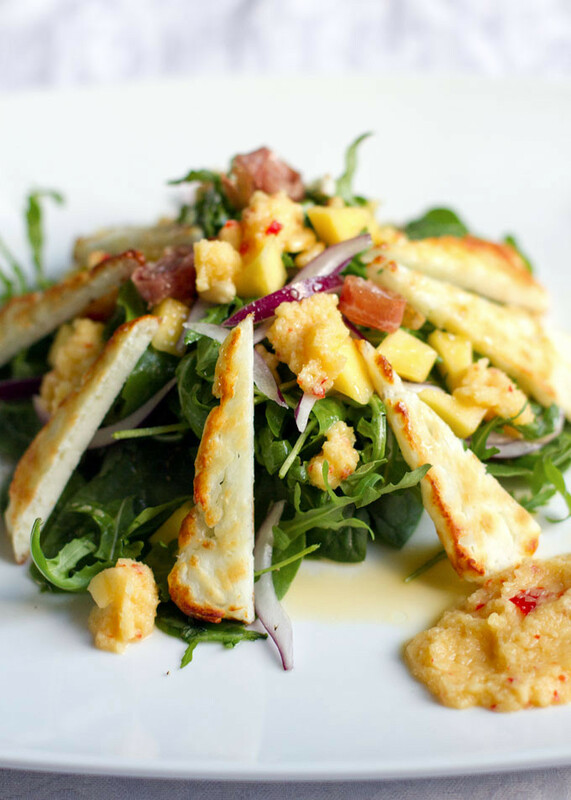 Carefully slice the Halloumi into sharp wedges, and evenly place around the base of the salad with the sharp tip pointing upwards. Finally, drizzle the salsa over salad and add ½ tbsp in the corner of the plate to dip Halloumi cheese into. Place the red chilli in the mini-bowl of a food processor, and blitz. Then add the mango, lime lime juice and sugar for 30-45 seconds oruntil the texture is thick and smooth. Pour into a bowl, cover, and refrigerate for 1-2 hours.